Engineering Research Center of the Construction Crusade; Jihad e-Sazandegi; Jahaad-e Saazandegi; Construction Jihad; Jahad-e Sazandegi; and Jahad; also Jahad Engineering Research Center; Jahad Sazandegi Research Center. The entire Ministry has 12 different divisions and a number of organizations, directorates, offices, and companies. Research centers were established in 20 provinces throughout the country. According to the National Council of Resistance of Iran, there are four affiliated research institutes in the cities of Isfahan, Shiraz, Tabriz, and Mashad that are involved in biological weapons research and production. Fourteen applied-science training centers have been active in more than 30 courses of study needed by the Ministry. Today, the Ministry has acquired 300 researchers at doctorate and graduate levels, 1,000 researchers at undergraduate levels and 2,500 at technician levels. Approximately 5,000 of the Ministry's personnel are pursuing their studies in training centers at home or abroad in livestock, natural resources, fisheries, and rural development fields. The Construction Crusade appears to resemble the US Army Corps of Engineers. It focuses on engineering research for defense, natural resources, animal husbandry, fisheries, and utilization and processing of products. The Ministry of Jihad-e Sazandegi (or "striving for construction and development," better known as Construction Crusade) was formed in 1983 by Imam Khomeini and the Islamic Consultative Parliament to address poverty through rural development and construction and agricultural growth and self-sufficiency. The Ministry played a crucial role in the Iran-Iraq War by constructing strategic bridges, floating bridges, floating vehicles, submarines, freeways for armored vehicles, and special vehicles for use in marshy fields. In the spring of 1983, the office dedicated to army engineering research was moved from war fronts in the south of Iran to Tehran. This Engineering Research Center was the starting point for Jihad-e Sazandegi's future engineering research activities. The National Council of Resistance of Iran reports that during the Iran-Iraq War, the Construction Crusade was affiliated with the Islamic Revolutionary Guards Corps (IRGC), a revolutionary group allegedly leading the production and employment of WMD in Iran and advocating the funding of terrorist groups. The same source notes that the Research Center, now managed by Fadhlallah Wakili-Fard, was originally supposed to be part of the Defense Ministry, but was established separately by IRGC Minister Muhsin Rafiqdust to avoid detection. According to Paula A. De Sutter, the Construction Crusade acted as the corps of engineers for the IRGC, aiding in the production of material for Iran's biological, nuclear, chemical, and missile programs. The Construction Crusade's engineering research centers have implemented projects in the fields of defense, natural resources engineering, animal husbandry engineering, fisheries engineering, and utilization and processing of products. The Ministry also provides natural disaster relief, army engineering in war fronts, and reconstruction of war-stricken villages. Rural projects include construction of roads, baths, mortuaries, and libraries in rural areas. The Ministry also works to provide training, employment, electricity, potable water, and water for irrigation. After 1987, the Ministry began projects to support rural industries and cooperatives, increase livestock production, and develop Iran's fisheries. The Ministry also constructed three large wheat silos in the cities of Tabriz, Takistan, and Rasht. According to reports by US experts and Israeli sources, the facility near Tarbiz is being used to store stocks of Bacillus anthracis and botulinum toxin. The National Council of Resistance of Iran reports that the Research Center is manufacturing an advanced fermenter designed by its scientists. Directly accountable to the Majlis, the Minister of Jihad-e Sazandegi is a member of the President of Iran's cabinet. Arnold Beichman, "Arsenal of Poison," Hoover Digest, No. 3, 1999. Remarks to the Press by Soona Samsami, US Representative of the National Council of Resistance of Iran, 26 January 1999. Arnold Beichman, "Arsenal of Germs in Iran?" The Washington Times, 26 January 1999, p. A17. Anthony H. Cordesman, Iran's Military Forces in Transition: Conventional Threats and Weapons of Mass Destruction, p. 237. 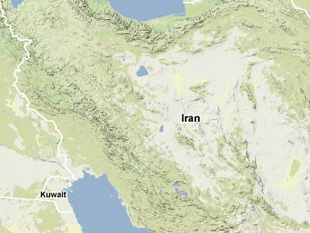 Uzi Mahnaimi and James Adams, "Iran Builds Biological Arsenal: Israelis Warn of Teheran Plan to Poison Europe's Water Supplies," Sunday Times, 11 August 1996; in "Israelis Warn of Teheran's Biological Arsenal," FBIS Document FTS19960811000139. Chemexcil "The Internet in Iran: A Survey," Neda Rayaneh Institute, www.iranian.com, 1997. "Jihad Striving for Development and Construction", Public Relations of Jihad-e-Sazandegi, Summer 1993, pp. 8-45, www.netiran.com. Paula A. De Sutter, Denial and Jeopardy: Deterring Iranian Use of NBC Weapons, National Defense University Press; FBIS, Tehran Domestic Service, 27 April 1986. The National Council of Resistance of Iran, Paris, 13 August 1997, www.iran-e-azad.org.